You can find Melissa here and here on Ravelry. You can see more of her designs here. Everywhere! Photographs, runway shows, shopping the stores, trend books, and nature. Because of the nature of my job, I am constantly surrounded by information and inspiration, knowing how to filter it all out into what is useful is the key. Hmm, that's a hard one. I suppose my favorite technique is more of a finishing technique than a knitting technique. I love the tubular cast on and bind off even though they take a little longer and a bit of concentration to work. Both leave such a nice clean edge! I also like 1 row buttonholes a lot. I determine my size range on a design by design basis. If it's a no fuss design in a silhouette that looks good on everyone, I do a complete XS - 3X range. Sometimes, as a garment gets larger, the design just doesn't work well proportionally as in smaller sizes. In this case, I do a smaller size range. If a garment has quite a bit of ease or the stitch pattern just doesn't allow a standard size range, my gaps between sizes might be a bit bigger. I do, but not for the purpose of being inspired or doing "research". 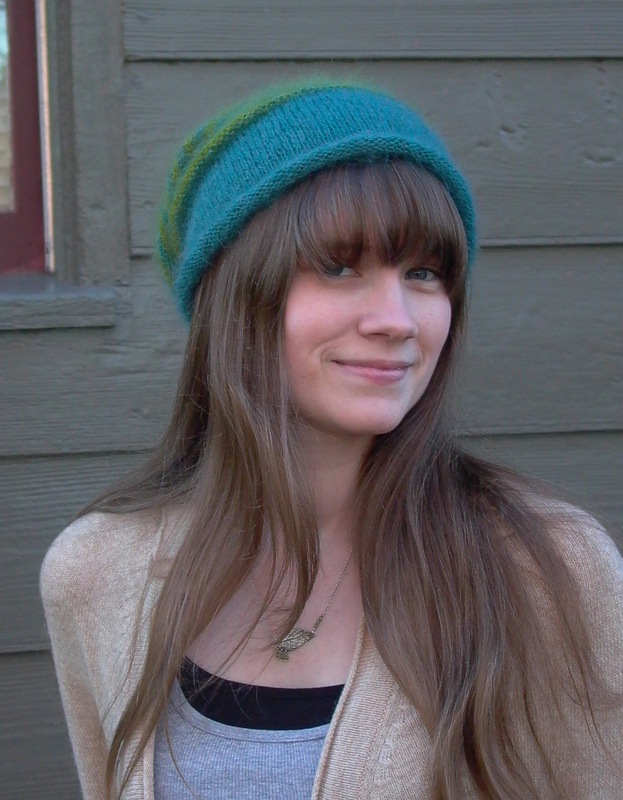 It's always nice to admire other indie designers and when I have time, knit their patterns! When writing a pattern, I try to make them as complete and easy to understand as possible. 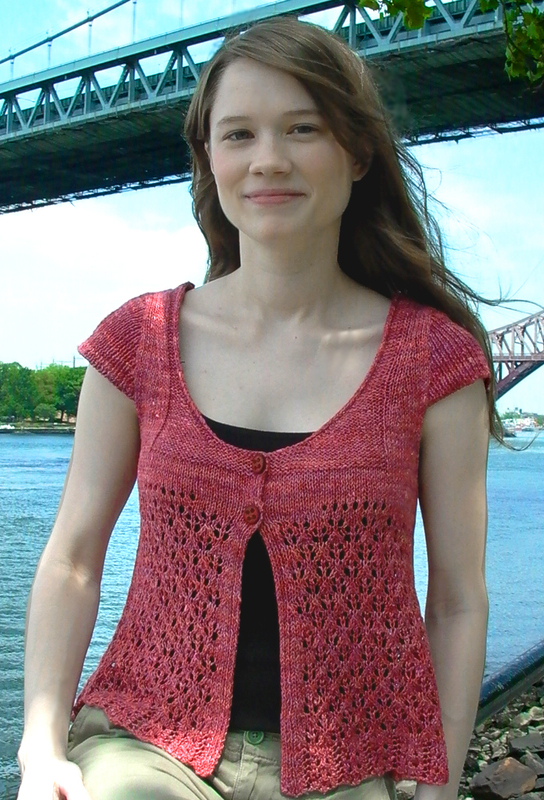 I also tend to design slightly more challenging knitting patterns because it is what I like. I am always willing to help a knitter out and direct them to different sources to find information if I can't provide the help they need. Dumbing down knitting patterns is really doing a disservice to knitters. Knitting should be about learning knew things and sometimes that means going through a little bit of a struggle. With some knitters a certain amount of hand holding is needed, but once it "clicks" it makes it all worth it! I have only had one design sample knit for me because I just didn't have the time, other than that, all of my designs are knit by me. It is hard to find sample knitters to trust and the ones I would trust are always too busy! Regarding test knitters, typically I don't test knit my patterns unless they are small projects. There are a few reasons for this. 1. Since I work in the fashion industry and deal with different shapes and sizes of women on a daily basis, I know what will fit and what won't. 2. Testing a sweater in 6 sizes can get a bit time consuming. 3. Unless you provide the yarn to the test knitters, you never know what you are going to get. 4. Sometimes test knitters will automatically fix problems without ever realizing it. 5. A good tech editor is worth more than 7 test knitters. I recently saw a very heated thread on Ravelry about test knitting and that some knitters expected everything in every size to be test knit. Again, a good tech editor is worth it's weight in gold and test knitters just don't catch what a good tech editor will. As long as the tech editor and the designer know what they are doing, excessive test knitting just isn't needed. No, I'm just kinda flying by the seat of my pants here! My first indie pattern happened because I posted it on my blog and other knitters requested the pattern. Without the Internet, I think it would have been harder for me to build up the confidence to submit to magazines and to get my work out there. Then when Ravelry came on the scene, my business jumped to the next level. A good amount of the visitors on my blog come over from links on Ravelry. When I decided to update my blog and purchase my own domain name, that also gave me a boost and a more professional space to show off my work. YES! A good tech editor is a must before releasing any pattern. They catch any math errors and revise any wording that may be confusing. While errata still creeps in occasionally (we're all human), having a tech editor look it over can eliminate a lot of headaches and pattern support in the end. When a knitter purchases your pattern, buys yarn, and invests time knitting it, it is only fair for them to expect a well written, error free (or 99% free) pattern. Very carefully! I work full-time for a sweater manufacturer in addition to being a hand knit designer. It is very easy for me to get pulled into a never ending world of sweaters. Typically I work a full 8 or 9 hour day and then spend another 5 hours when I get home working on hand knit design. Working so much easily causes burnout, so on the weekends, I try to stay away from the computer, relax, and enjoy doing as little as I possibly can - although knitting doesn't count! You can never make 100% of the people happy 100% of the time. This is just a fact of life, not only with knitwear design. Constructive criticism is one thing, then there are a select few that can be mean for whatever reason. I just ignore them the best I can. Well, let's just say that I haven't quit my day job! I've made a decent amount from doing hand knit design part time, but I definitely could not live off of it. Make sure that it is something that you really, really, really love. That you love it so much that you are willing to work really hard even when the money isn't really rolling in. It is a lot of hard work to get started doing something on your own, and as with any new business venture, a lot of love, time, and patience needs to be given to be successful. I think what I like the best is that Melissa seems so *nice*. She seems great company for a cup of coffee and some quiet friend time. Where/how do you find your tech editors? I'd like to offer editing services but I'm not sure how to get started. I feel so inspired now! Great interview. Why are Knitters afraid to learn new skills? Designers - do you take other designers classes?